This year’s Goliath Main Event is nearly at the halfway stage for Day 1s and is already set to break all records. Perhaps it’s the mouth-watering £100,000 guarantee for first place, but numbers are already massively up on last year with more than 2,600 players so far, an increase of close to 20%. Yesterday’s Day 1c attracted a total of 842 entries, 200 more than competed on the Monday last year. Sunday’s Day 1b attracted 882 entries while Day 1a saw 946 players take their seats. There are still four more start flights to go – including today’s Day 1d starting at 11am – so don’t miss the chance to compete in Europe’s biggest tournament. If you haven’t booked your hotel yet, check out our rates for great places near the Ricoh Arena including rooms at the fabulous Royal Court. The current chip leader in the £100 + £25 buy-in tournament is still Day 1b heavyweight Bharat Singh who bagged up 562,500. He has taken part in several GUKPT events and won a £75 NL Bounty event in London in January for £1,950. Among those still in are 2015 Goliath Champion Miikka Toikka who made it through Day 1a with 116,500. This is the 11th year that Goliath has taken place at Casino Coventry in the famous Ricoh Arena. The Main Event is the largest live poker tournament outside of the USA. 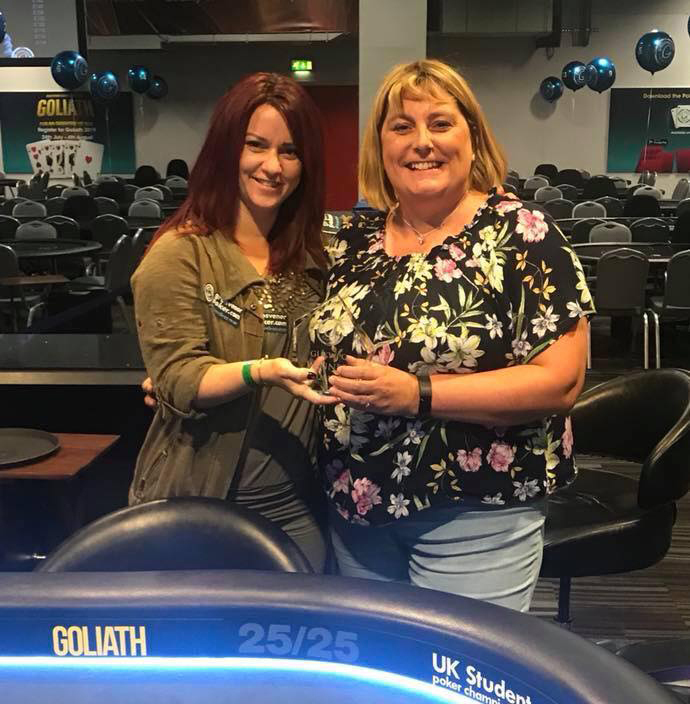 Rachel Clegg from Hull won the first ever Grosvenor UK Women’s Poker Championship for a massive £3,000 plus a Goliath Main Event ticket. With a total of 205 entries, it was the biggest women’s event ever held in Europe. The £50 buy-in tournament was hosted by Grosvenor Ambassador Katie Swift and broke records as the biggest women’s event ever held in Europe. The total prize pool was £10,250 with 20 players making the money. Elliott Marais won the 2017 Goliath Main Event for a career-best cash of £85,760, with a total of 682 players finishing in the money and getting a share of the staggering £638,500 prize pool.